What if you could live forever? Defy death itself? Even now, scientific advances in regenerative medicine, life extension, cryonics, cybernetics, and in other areas have brought humans to the brink of solving life's final conundrum. In this volume of the acclaimed ‘Future Chronicles’ anthology series, twelve authors imagine that uninterrupted journey, confronting not just how, but what it means when human life can continue indefinitely, invulnerable, immortal. 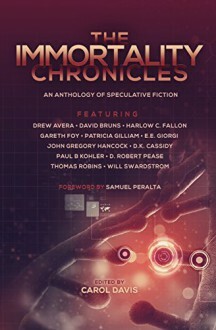 “The Immortality Chronicles” features stories by award-winning scientist and author E.E. Giorgi (Chimeras), Amazon bestselling author Will Swardstrom (Contact Window) and ten more of today's most visionary authors in science and speculative fiction.